What is a Forensic Photographer? Analysis of a "Snuff Video" -- Is it Real? The decedent led police on a five-mile chase after failing to stop for a moving violation. After stopping at a Circle K market, the decedent attempted to flee on foot and was shot by two officers who stated that they believed he had a gun in his hand -- it was not a gun but a metallic chrome colored cell phone. I am not involved in any official investigation but I was asked about the incident and I reviewed the three police car video tapes segments publicly available. 1. Could the officers could have reasonably believed the suspect was armed with a gun? 2. Was the suspect simply trying to flee or did he intentionally act as if he were armed? The suspect is still pointing the cell phone as a gun while a police officer (Armstrong) tries to grab him from behind. Imagine what the other (off camera) officer (Hathorn) is seeing now. Suspect turns towards Officer Armstrong who is holding his pistol at the suspect's face. Wouldn't this be sufficient to warn the suspect that he may get shot if he continues his actions? Suspect is fighting with Officer Armstrong who is clearly pointing his pistol at the suspect's face. Suspect has his hands together in front as if he is gripping a pistol. The two officers are now chasing the suspect. He could have stopped and raised his hands at any time. The suspect has partially turned around. The officer on the left (Hathorn) is ducking -- a clear indication that he believed the suspect was armed and about to shoot. If he knew the suspect was not armed, why would he duck defensively? More shots have been fired. Suspect continues to evade officers; his hands are still not up. This is a close up of the previous image. Note that Officer Hathorn on the left is again crouching/ducking down, apparently believing the suspect is about to turn around once more. The suspect has been shot several times and has fallen. A. It is important to note that when Officer Hathorn (on the left) stopped his vehicle, he saw the suspect in a combat shooting stance holding a shiny metallic object -- apparently aiming a firearm at him. When viewed from the front, it is very difficult (often impossible) to clearly see what someone is holding in a two-handed grip -- whether a gun or a shiny cell phone. B. 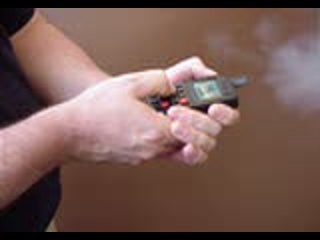 Law enforcement personnel are highly aware of the existence of a functional cell phone gun. This is a professionally produced (likely in Eastern Europe) firearm which is built in to a cell phone housing and looks exactly like a genuine cell phone. It would be reasonable to conclude that if someone is aiming a cell phone like a gun, it may indeed be a gun. C. Officer Hathorn's actions as seen in the video is consistent with a belief that he was in imminent danger of being shot. In the above video frames, he clearly ducks defensively each time the suspect turns toward him. A further review of the video segments shows that Hathorn also reacted similarly in the first part of the incident, when he had just stopped his vehicle and got out. The rear of the suspect's gold Cadillac is seen. Hathorn's vehicle appears from the left. Hawthorn has exited his vehicle and is standing at the open door. Out of view on the left, the suspect points/aims his cell phone. Hathorn reacts to the threat, ducks down behind his vehicle. The suspect has broken away from the other officer. Hathorn rises up. Hathorn is standing again, aiming and firing as the suspect moves away. In the short period of time the officers had to make a judgment about the situation, the very shiny, metallic appearing cell phone did resemble a firearm and it was prudent and reasonable for the officers to assume that it was indeed a firearm. This is particularly true in view of the the manner in which the decedent "aimed" or pointed the cell phone. Stopped for the first police car. Stopped at any time during the chase. Stayed in his stopped car until ordered out. Got out of his car with nothing in his hands. Not pointed the cell phone like a gun. Not resisted the officer trying to stop him. Stopped and raised his hands when he saw the officer's gun in his face. Stopped and raised his hands when the first shots were fired. Not turned around pointing the cell phone again while being chased. Dropped to the ground at any time.